Click on the Join Now Button and fill in your personal details. take a clear picture of the front and back of your driving licence. Upload when prompted. Next, take a clear picture of yourself holding your driving licence and upload this when prompted. While you wait for us to activate your account, download our app for iOS or Android. 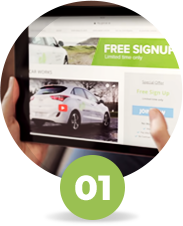 You can book a car or van by logging into your account online here or through our app using your customer number and pin sent to you via email when you signed up. 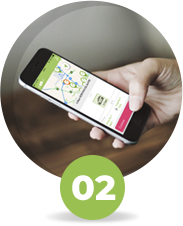 Simply select the car on the map you want to book and input your pickup time and your return time. During the booking process you’ll have the option to add hourly insurance if you like and apply any promocodes you may have. Once your booking is in place our app will remind you of your upcoming trip. When you’re on the way to your GoCar click “Locate my car” which will appear on screen as shown below to be guided straight to your car’s location. 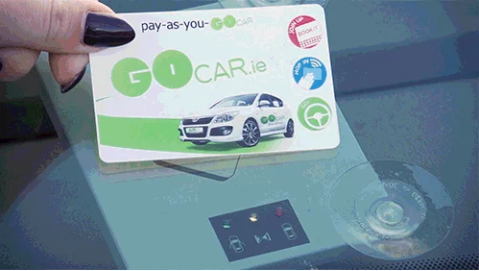 Hold an Access Card ( see how to add one here) to the card reader on the windscreen until the light changes from red to green and the doors unlock. Hold down the unlock button on our app until the circle fills and the doors unlock. Either method is fine to use, we do recommend carrying your card with you as a backup option in the event network signal is bad or your phone encounters any issues. The keys to your car are waiting for you inside. 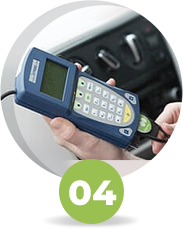 Open the glovebox and you’ll find them slotted into a keypad inside, just slide them out and you’re good to go! Remember to put the keys back in this slot to end your trip. As with most new cars you’ll need to push the clutch down while turning the key in the ignition to start the car. Drive the car as normal and if you are getting out during your trip lock the doors using the car keys. To finish your trip you’ll need to return the car to where you picked it up from. If the car has a dedicated space park it there, if not park it as close as you can to where you collected. Please remember to always park legally, do not park in clearways or timeshare spots. Once you’ve parked place the key fob(small circular disc attached to the keys) back into the keypad console in the glovebox. Make sure you’ve got all of your belongings, exit the car and lock it using your GoCard by holding it o the reader or by clicking end my trip in the app and hold the lock button. We ask that you return the car with at least a quarter tank of fuel. The PIN is located on the driver’s sun visor. Click on the Join Now Button and fill in your personal details. Take a clear picture of the front and back of your driving licence. Upload when prompted. Take a clear picture of yourself with your driving licence. Upload when prompted. While you wait for us to activate your account, download our app for iOS or Android.